Welcome to Handmade Originals by April Cummins. The are all ONe of a Kind. This Santa is dressed in his olde red santa suit adorned with fur trim and olde green pants. His hat is adorned with olde flocked greenery and tiny berries. He has a snow covered christmas tree and an Olde fashioned basket with a cardinal perched inside atop a moss nest. He is carrying a child toy drum which I have hand sculpted and hand painted, a hand painted toy rocking horse with hand dyed wool mane and tail, a christmas garland with tinsel, and an Antique quilt toy sack on his back filled with vintage look hand sculpted and hand painted toys. I antique these toys and sculpt them to look like olde tyme vintage christmas toys. Mr Claus is heavy, His fingers, face and boots are all hand sculpted and painted one at a time by me. His beard is curly lambs wool..
His arms are wired to pose and he measures aprox 20 inches, He will make a wonderful addition to any Christmas Holiday Collection. 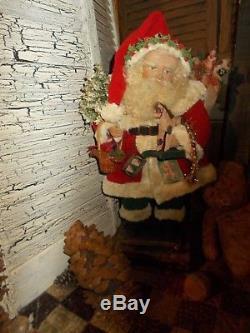 The item "Primitive Santa Claus, vintage CHRISTMAS TOYS, basket, antique quilt, HANDMADE" is in sale since Saturday, September 22, 2018. This item is in the category "Antiques\Primitives". The seller is "april-cummins33" and is located in Herod, Illinois. This item can be shipped worldwide.